One of my least favorite traits is overcommitment–meaning that I always commit to too many conferences/papers/projects and something always falls by the wayside. My batting average is pretty good, but I still swing at the air a bit more than I’d like. So, while I have the attention of the Cal community, I’d like to let one of my pet projects escape and maybe be picked up by someone who can properly feed and nurture an honors thesis out of the thing. 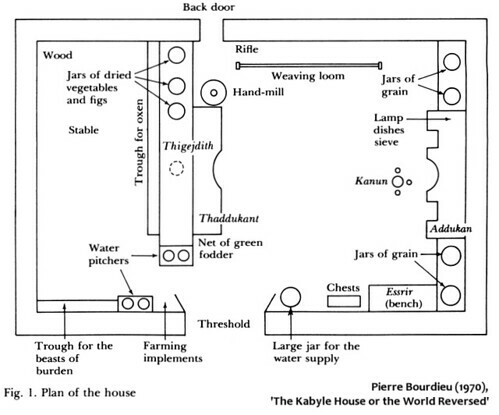 I’ve been intending to reproduce Bourdieu’s Kabyle House in Second Life as a fun exploration of digital habitus, with the attendant theory in scroll-overs, but I just don’t have the time. If anyone would be interested in this project, drop me a line. Or just do it yourself, and let me know about it!